A supercomputer is a computer wi a heich level o computing performance compared tae a general-purpose computer. Performance o a supercomputer is measured in floatin-pynt operations per seicont (FLOPS) insteid o million instructions per seicont (MIPS). 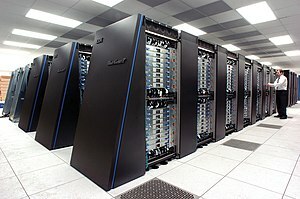 As o 2015, thare are supercomputers which can perform up tae quadrillions o FLOPS.